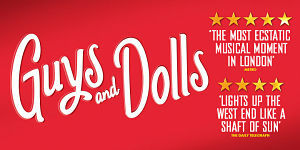 The Chichester Festival Theatre's critically acclaimed production of Guys and Dolls is extending its run in the West End transferring from the Savoy Theatre where it is currently running until 12th March to the Phoenix Theatre for a limited season from 19th March to 30th October 2016. It is also due to go on a short UK tour from 16th March-30th July. Casting for the transfer has just been announced with Samantha Spiro taking over the role of Miss Adelaide from Sophie Thomson:Richard Kind taking over Nathan Detroit from David Haig: Oliver Tompsett is Sky Masterson (currently Jamie Parker). Siubhan Harrison will continue as Sarah Brown. Continuing in his role from the Savoy to the Phoenix Theatre is Gavin Spokes as Nicely Nicely Johnson. Completing the new cast at the Phoenix are Billy Boyle as Arvide and Jason Pennycooke as Benny, with the rest of the cast transferring from the Savoy Theatre: Lucy Jane Adcock, Abigail Brodie, Cornelius Clarke, Momar Diagne, Lavinia Fitzpatrick, Lorna Gale, Nic Greenshields, Selina Hamilton, Frankie Jenna, Alec Mann, Jacob Maynard, Genevieve Nicole, William Oxborrow, Max Parker, Carl Patrick, James Revell, Giovanni Spano, Jonathan Stewart, Lucie Mae Sumner and Liam Wrate.